The 42-1 District Court, located in the City of Romeo, has posted a list of possible fines and costs for various crimes. The list also contains a warning as follows: ALL FINES AND COSTS ARE DUE AT THE TIME OF SENTENCING, WE DO NOT GIVE TIME TO PAY. This warning is followed by strong language that failure to pay fines and costs will result in jail time. The approximate range of fines and costs for a first offense Operating While Intoxicated (OWI) or Impaired Driving (OWVI) in the Romeo District Court is from $1,000.00 to $1,500.00. For a second offense, the range jumps to $1,500.00 to $2,500.00. This does not include other costs such as probation oversight expenses, substance abuse screening, driver responsibility fees, police/municipal response costs, random testing and substance abuse counseling. The driver responsibility fee for OWI is $1,000.00 per year for 2 years and for $500.00 per year for 2 years upon conviction of Impaired Driving. 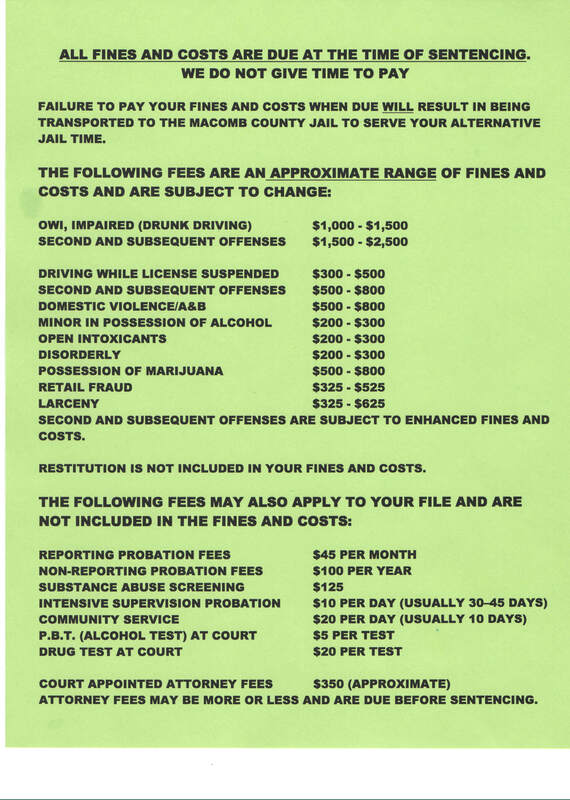 The fines and costs for drinking and driving offenses in the 42-1 Court in Romeo tend to be on the high side but are consistent with fines and costs imposed in other courts such as the 41-B District Court, Clinton Township, which is also located in Macomb County. Information about other district courts located in Macomb County can be found at the county’s website. The 42-1 District Court has jurisdiction over the following municipalites: Romeo, Washington Township, Ray Township and Armada Township and Memphis.